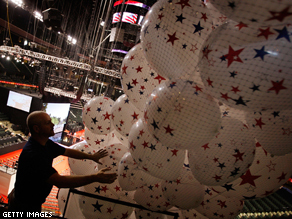 Ready for start of 2012 presidential campaign? And that means another presidential campaign is already under way. That's unfortunate, but we really don't have a choice. Potential Republican challengers to President Obama are popping up everywhere. You can spot them in the early voting states - like New Hampshire, Iowa and South Carolina; and you can hear them weighing in on national debates, like raising the federal debt limit. What makes it worse is a lot of them are the same bunch we were subjected to last time around. Former Arkansas Governor Mike Huckabee is all over the place promoting his new book, and former Massachusetts Governor Mitt Romney just returned from a week-long trip to Afghanistan and the Middle East - gotta beef up those foreign policy credentials. The country's been there and done that with Romney and Huckabee. A newcomer, former Minnesota Governor Tim Pawlenty, had already made numerous trips to Iowa by last summer. Others are hinting they may be interested - including Donald Trump. He does that every four years. One strategist tells Politico the potential candidates "are like bubbles in a shaken bottle of champagne. They are anxious and ready to pop." A couple of new polls suggest Huckabee, Romney and Sarah Palin are still at the top of the Republican pack with Newt Gingrich, New Jersey Governor Chris Christie and Congressman Ron Paul bringing up the rear. On the other side, the Democratic National Committee announced today that President Obama's re-election campaign will be based in Chicago starting in March or April. Here we go again. Here's my question to you: Are you ready for the start of the 2012 presidential campaign? I can't wait! I'm a Canadian, so this is blasphemy, but give me a good old rootin' tootin' American election campaign over a hockey game any day! It's TV at its best. Which of her dainty feet will Sarah Palin insert in her pretty mouth next? Who's going get caught talkin' trash into an open mic? Is the Donald going to toss his hat in the ring? Is Nader? Will Hillary swap jobs with Joe? Will Joe pull a "Joe"? Will Hillary pull an upset? It doesn't get better than this, even on skates! Hell no. I want to see less campaigning and a little more governing. I admit it, I'm an election junkie. It's my favorite sport (short of Bears-Packers games of course). I was thrilled when Vilsack announced right after the 2006 midterms and Obama and Clinton not far behind. Come on, Republicans, I'm bored with you all. Let's rumble... peacefully. Here in Mississippi all the talk is about Haley Barbour and his plans to run for president. It has been speculation in all the news and the talk of the town in the state capitol! The sooner it starts, the sooner it's over and then we can all get charged up over the 2014 midterms. Why don't you just ask if we're ready for those Mayan end-of-the-world predictions in December of 2012? That'll probably be more fun than another election campaign. It would almost be worth the end of the world if it means we never again have to listen to hypocritical campaign rhetoric from either side! As ready as I am to see you, Jack, and Rosie O'Donnell together doing the tango naked on "Dancing with the Stars." I hope the civility remains a forefront issue in this election...I doubt it, but I can hope. When I listen to Sarah Palin, I lose all hope for that. We shall see. Bring on those nasty, evil, corrupt , bought, Republican candidates for the nomination for the presidency! We all know that greedy Lobbyists have their suitcases filled with dirty money, ready to pay off anyone, willing to vote Republican! Who's kidding who, Jack Cafferty! The truth has been out quite a while now! It's up to you, the American public, whether to accept the bribe, to your eventual total destruction, or whether to follow your ethical consciousness, for the better and moral American society, which will survive! Didn't it start November 5, 2008???????? One would think it did listening to Cable News. Absolutely not. This country appears to be in a perpetual campaign mode. It is nice not to be hammered with the constant commercials slamming the opponents of the candidates. If they would just cut out the nasty remarks and tell us about their qualifications and why we should consider voting for them that is all we need to hear. I know this is just wishful thinking but it would be a welcome change. Start? It never stopped. Campaign rhetoric (lying), which was excused to some degree, used to end after the election. Not anymore. Facts and truth are things of the past. Nowadays, it's horse hockey 24/7. yes,we are; If knowledge means power,then Ms.Palin and friends are powerless. Jack: I want to see a serious debate of ideas and solutions that face this nation. Yes, I look forward to one of the greatest freedoms this nation affords to its peoiple, national elections. I may not like who gets elected, but I will defend to the death the right to a secret ballot and the election process. Bring it on!!! I sure am! I can't wait to vote Obama again to ensure that the radical right's policies get vetoed. The 2012 campaign started on November 5, 2008. Haven't you been paying attention? No. If I win the lottery I'm buying an island in the middle of the ocean and hiding out until 2013. About as ready as I would be for a plague of locusts. It's no wonder the U.S. is in such bad times. Those elected don't govern; they're too busy campaigning. i am ready for a true independent from the 2 party monoplized capitulation of this great nation to renegotiate with the offshore 3rd world indsustrialists presently maintaining repressive status quo as they force us to close our libraries on the west coast and elsewhere becuZ we as locals keep having to pay the debt from the infrastructure supposed to have been paid by offshore and the sellouts who got special interests subsidies wrongly taxed on locals and not the billiionaires in 3rd world who refuse to alleviat the 3rd world influence where they are from as they prove money worshipping and hippocritical in not allowing a trickle down effect that uses the left over money to buy off our govt's desperate ventures to create jobs that empower what devours our future, cuz the profit margins have enough left over to pay off the media, the govt and the non working shareholder welfare bourgosie class!!! Yes I am. Let the games begin and the sooner the better. Television shows are poor at best and at least with the debates happening it is the best comedy on TV. I just hope that Palin runs for the Tea party and Hillary runs against President Obama. You bet. There is nothing more inspiring than a bunch of wealthy egotists wasting millions and possibly billions of their and taxpayer's dollars on themselves, knowing full well they don't stand a snowball's chance in hell of winning. Especially in this economic time of crisis when these dollars could be spent on greater and nobler causes it is even more so. I just wish it was only their own money being put to waste and not those in need. I can tell right now who will be our next president. Why another campaign? Require resumes. Extend term limits. It probably means that states recognize this may be the last, and perhaps best, opportunity to regain control of their own budgets. For decades, our cowards in Congress have passed unfunded mandates on to the states as a way of masking the cost of the Federal Government. Now, the bills on these mandates have just about overwhelmed the states' ability to set their own courses. At some point, the new programs and spending just have to stop. Let's hope the courts can find that there are SOME limits to Federal authority. No but that won't stop them from campaigning. They have to actually, because it appears the President is campaigning every day and has been campaigning non-stop since before he became President. Yes jack I can already see the GOP has nothing to offer the middle class! Doing away with health care and give the rich tax breaks! I think that about sums it all up for me! Every four years, I get hopeful that things will change and we can get good leaders. Every four years, the media uses its influence to give us someone that hurts the country. If I thought we had a chance of getting real leaders in 2012, I would be excited. Currently, our leaders have governed sporadically. Usually, they are in campaign mode. This nation has many challenges that need to be solved. We will not solve them with rhetoric, sound bites, perceptions and wasteful spending. There are many Americans who could make a real difference but they are seldom allowed to play since opportunity is driven by politics, image, the latest tech tools and nonsense. These folks have been waiting for real opportunity for so long they're getting barnacles. No, I'd give it a rest for about a year Jack. And, during that period, perhaps the Republicans could come up with a candidate that just might win in 2012. Maybe somebody like Donald Trump. I thought it has already started. I know Congress hasn't stop playing politics. They're throwing insults at each other like it was the last week of the campaign. I would love to see Sarah Palin run for president. It would be fun to see her conduct her campaign only by appearing on Fox News. One thing for sure it won't be boring watching the republicans this campaign. They used to send out the same message like trained robots. Now with Palin and the Tea Party stirring up the mud that should make things a lot more fun. You've got to be kidding, right? Why would anyone in their right mind want to be subjected to the drivel spewed by candidates? Now if we had real debate on real issues then I would welcome it with open arms, open ears and an open mind. The2012cmpagin statered sometime ago. Wehave no say in the timing, but Iill pay no attention until the New Hamphire primary. If I had control, I would prohibit campaining before June of the lection year. Absolutely not! I was sick of campaigns even before Palin infected the media like a plague, and I’m seriously considering moving to a country that has a dictator – at least I’d be spared continuous election coverage every single day other than election day. What do you mean "the Start"? This "dog and pony "show never stops".You know some of us have real jobs and real issues out here in the real world. Somebody do the job you were elected to do in congress. The more this continues the more it looks like these low budget reality shows that waste our time as well. Tell me it isn't that time again. We just had one circus now another is headed our way. Jack can the press cover viable candidates and keep away from the "look at me I'm too stupid to shut up" people? tampa, fl Since one of my Senators just threw his hat in the ring for a 3rd term, and voted for Amnesty along with our current President, yes, I am ready. We just got rid of 61 of those fat, arrogant, corrupt, stupid, politicians that did keep voting for amnesty, I can't wait for 2012 to get rid of the rest. We didn't have a choice in the matter. The 2012 presidential campaign started in December 2008. We have been in it for two plus years already! Not really Jack. To be honest i have tired of the whole political scene. All the cut throat redirect and having to sift through all the lies to get to one grain of truth just is not worth the effort any more. I have become disillusioned with our government and it's leaders. We are suppose to be fiscally responsible and pay our taxes but our congress can not even pass a budget much less live within it. There is little hope for us and less for our leaders. Well,, ready or not, here it comes! Just exactly when do all those folks WORK? No wonder nothing ever gets done in our country, everyone who should be WORKING is way too busy doing something else, if not campaigning, then raising millions to do so. Gimme a break! Harvard History Professor Arthur Schlesinger conducted a poll of historians to identify the ranking of presidents. Lincoln came in first and FDR came in third. Both heroes and role models of president Obama. I think Obama is better than Lincoln and as good as FDR, so you're darn right I'm ready. America is evolving into the hope of what it could be. Just another year of seeing a bunch of game show hosts in a beauty pageant pointing fingers at the other side. I can hardly wait.. Voters will expect a greater measure of accountability from candidates vying for the 2012 Presidential primary nomination. Campaign promises from all Parties will have to bear greater scrutiny from the public to achieve the credibility needed for real change and a return to growing prosperity for the beleaguered middle class. High unemployment and the urgent need for jobs will require more than simple generalizations and hopeful rhetoric. There may be discontent with the status quo but changing horses in the middle of the stream isn't necessarily the best choice or likely outcome for the 2012 election. I don 't want to see another politician until 90 days before the 2012 election. If they can't convince me in 90 days, they are not worth my vote. As long as they run a clean campaign & only focus on what they will do if elected & how it will be accomplished. And if you believe that Jack, I have a great deal on a bridge that's back on the market ! I admit it, I'm an election junkie, it's my favorite sport (short of Bears-Packers games of course), I was thrilled when Vilsack annoucned the day after the 2006 mid-trems and Obama and Clinton not far behind. Come on Republicans, I'm bored with you all, let's rumble...peaceably. The mass Liberal Media decided on the day after the 2008 election that Obama was going to be a two term president, so I don't really know why we are even bothering to go through the motions of a 2012 election. The Republican nominee will be called everything but a child molestor to keep Obama in office.....and it will probably work. No, can't we just put it off a couple years and have no one in office? Looks like the USA does what it wants with out any help from a main person. You missed it Jack. Republicans started voting against everything Obama has tried to do and will continue for at least the next 2 years or when hell freezes over. And, the republicans all march in lockstep, all good soldiers, no real leaders for the people. No, I think to start this year is grossly premature and an impediment or distraction for work that needs to be done and issues that need to be tackled. What we need right now is focus and the beginnings of meaningless campaigning will not help at all. In a word, NO. I have not recovered from the last campaign, some of the previous candidates are still constantly seeking media coverage. I like to view news programs to hear the news and a bunch of politicians belching out their vitriolic attacks on whoever they feel is their opponent is not news, it is just disgusting. Didn't the campaign begin the day President Obama was elected? Yes, let the games begin!!!! Heck Yeah! !..I'm ready Jack! I got my "Monster" energy drink, popcorn, and a front-row seat. Just waiting for Wolf Blitzer to yell "Let's get ready to rumble!!" Lol..good, hilarious times ahead..can't wait. I need to get a tetanus shot and hip boots before wading into the next batch of campaign manure. There is a mathamatical answer to the 2012 campaign. Reality is afterwards.... Pray for the Best outcome! Am I ready for this circus full of false promises to begin anew?...NO, they all need to keep their mouths shut for another year, at least. Absolutely not, it's too early. Obama should give the one Billion Dollars he plans to spend on campaign to people who need food in America...yes in America. Why? He is not going to be able to fool Americans this time as they are keeping a running record on all the Anti American moves he has made. My brother has had 4 couple friends, inc two Drs, move to Canada. That's how fed up some are with this Socialist agenda. Wish it was the 1960's and someone might be arrested by now. The sooner it starts the sooner it's over and then we can all get charged up over the 2014 midterms. Didn't we just do this? They're saying that President Obama has set a goal of raising a billion dollars for his campaign. A Billion with a capital 'B' Jack. That's just flat out nuts. That money could be put to a lot better uses than a political campaign. Time to look at election costs again and maybe even take a page from the British and have the government provide the funds for people to get elected. I say about $100 each. And even at that amount, they are not worth it. Yes, we are ready for the 2012 campaigns to begin. Just added broadcast media to the investment portfolio. Now that there are no limits on campaign spending the media will profit. Today's Rasmussen Poll had "anyone" at 52% and Obama at 41%. He is done, and many democrats saying the same thing...he's all over the map, changes his mind, sticks up for the terrorists, and fickle as a child. He has succeeded in moving many Dems to Independents in the past 2 yrs, and he fabricates like a 2 yr old child. As ready as I am to see you, Jack, and Rosie O'Donnell together doing the Tango naked on "Dancing with the Stars." In other words, I'm chomping at the bit. Republicans will not get a single vote from me. I decided that when the held the country hostage in december. I cannot believe that I actually voted for some of them in 2010. Thank goodness we can rent/download movies and listen to satelite radio. The thought of listening to politicians' b.s., name calling and general juvenile behavior for the next two years is nauseating. I still (foolishly perhaps) hold out hope of hearing someone tell me their plan for fixing the overwhelming problems we are facing instead of the normal finger pointing we get. I hope Obama gets a second term. So do a vast majority of Canadians. The GOP have nothing to offer their own country or the rest of the World. Regardless of who wins, our political system is tainted and dysfunctional. We need more choices than just Dem and Repub. We will continue to steadily become a third world country because greedy politicians continue to rob and sell out the American people while making their special interest deposits. We lack jobs, and education, while steadily losing our respect for values, and the law. A non productive society is a dangerous society. We need real leadership but we must start with ourselves. I am ready! the GOP really knows how to get SNL and Comedy Central some killer ratings! Jack, how did you know I just took our TV to the landfill? Where are the jobs that the Republicans campaigned on? Why are they so focused on health care? Do they not get it? That is why the Dems got voted out. I just feel we need more choices. The Repubs and Dems are just sad. we should eliminate the "2012" and just have a continuous campaign..seems that is the reality anyway..elections don't really have consequences, just perpetual finger (middle) pointing..
NO. The jokers who want to run need to get their own t.v. channel so that the people who want to watch and listen to the crap that comes from the campain adds can do so. The rest of us should not have to be subject to it. Also the billion $ Obama has raised should go to help people in need. Just don't let the government try and help they would turn it into debt real fast. It would be so nice to actually have some form of public media that is actually interested in presenting the news of the day and maybe some in depth reporting. Unfortunately, those talking heads in the media refuse to even consider that their profession is a farce. Freedom of the Press was intended to allow the actual story to be put forward, however, the Press is now creating the story. Case in point- Palin. The Press is constantly shoving her in our face. She is not news, nothing she says is of value. However, what is going on in Iraq and Afghanistan is real and important but not to the so called Press. Can't make money reporting on the war. The Press is pathetic. I can't wait for a more propaganda laden garbage. "The FED does not manipulate markets." ~That is what it is basically designed to do. "We need to pay more taxes." ~Start by cutting every government service that is a nonessential. Stop borrowing/printing money. Cede education to local school boards, give more authority to local (tribal) governments. Government is not god; rather, government is a parasite with a gullet the size of a black hole that has approximately the same appetite. Are you sure that the Parties are ready or is cable news beginning to loose ground and trying to find ways to get ratings up. No, I'm not ready Jack, but that doesn't alter the fact that it already has started. It started as soon as Obama was elected. I pray that there will be civil and productive dialogue, but I'm not holding my breath for that. Especially not when corporations pay for a candidate who will vote to benefit there corporation at the expense of the common person. Ready or not Jack, looks we are stuck with the likes of Huckabees, Romneys, Gingriches, Palins & such. Have we come to the point where this hapless nation cannot produce leadership with vision, weight of intellect, foresight and wisdom? If this is the calibre that challenges President Obama come next elections and he loses then the world would certainly give up on us. We had earned the ridicule of the international community when we re-elected G.W.Bush and whatever prestige we could salvage by electing President Obama was lost with the mid-terms. Perhaps Trump, Roseanne, Rush Limbaugh, Glenn Beck, Bill O'Reilly etc would also oblige us by jumping in. Jack, we need to revisit term limits because constantly campaigning and seeking re-election inhibits our elected officials from performing their duties while also influencing their decisions. Now it's all about what do I have to say or do to get re-elected, not what is best for the country. Come on, we still have 2 baseball seasons, 6 Survivor seasons, Super Bowl and subsequent NFL lockout, hundreds of interviews by Piers Morgan and a thousand Palin facebook postings/tweets before the race gets going in earnest. Lets focus on the immediate items and then cover the race when it arrives. I'm ready because I don't think any of the Republican candidates are particularly impressive. Palin's a joke, and Huckabee and Romney are too fundamentalist. Trump doesn't have a chance, Christie's corrupt, and Ron Paul is just loco. We might as well be. That is a politicians only requirement, to run for reelection. the government is in the hands of the many and various agencies who take their orders from the corporate executives. we don't elect the people in these agencies so we might as well sit back and enjoy the childlike antics of the politicians. Here is hoping that in the next political campaign we hear more honest dialogue than we got in 2010. I wish that the media would refuse to air advertising that is merely intended to confuse and mislead. Give the voters the truth and let the chips fall as they may. No I am not. If I have to hear about the 2012 election for the next 22 months I'm going to go insane Jack. What we have here are interchangeable candidates , we will still be at war, we will still have 10 million illegal mexicans , we will still have 10% out of work, and the government will substute public opinion for the law. An American preparing for a political campaign is like a fish preparing to get wet. You can't prepare for a situation in which you are constantly involved. One campaign runs into the next, and so on. The question should not be if we're ready for the campaign. You should ask how we cope with perpetual electioneering. I wouldn't mind, Jack. Then we'd get to have more water cooler discussions that start with "Can you believe what Simple Sarah said yesterday while stumping in the state of ..." and ends with "I hope she goes away once the election is over. If that doesn't convince her that her 15 minutes is LONG since up, I don't know what will." That campaign has been going on for 26 months already.No, I am not ready for it, nor do I want to be. the G(reed) O(ver) P(eople) continues to play the ANTI Robin Hood, they take from the poor and nearly poor, and give to the richest , top 2% of wealth owners in the US and abroad. They have and continue to LIE (non existant.. "DEATH PANELS etc.) about anything they wish, then point fingers of hate at those that vhallenge them or respond. Ready to look more at the darker horses, where new blood we haven't seen before can come from. No interest in anyone, who has run before, at all. Jeez! My head is still spinning from the last one. I think we need to focus on getting something done before we start another round of character bashing by childish morons (politicians). Yes, for sure. The Tea Party will have mostly been disbanded, the Palin's and the Angle's(and radical whack a doodles) will have had their day and even now have been found to be very annoying. So I look for a far more balanced atmosphere. I, like many Americans, have gotten our fill of the party of "no" and don't want to elect people who are not going to work but only say "no." It just won't work any more. I have finally decided to stop voting. I first voted in 1974 and have been a good voter since then (meaning I take the time to go vote). Not all my choices won and that really does not matter. What matters is like what Ralph Spyer said above "what we have here are interchangeable candidates." and for the most part that is true. So it really makes no difference who is running the loony bin because they jerks in Washington and yes my own states' legislature are just not capable of fixing anything. If someone sane comes along and brings a lot of other sane people with them then I will go out and vote again. Until then, bah the current government in Washington is useless. It is way too early to even think about an election, which is almost two years away. I think that the campaigning should not start until the begining of 2012. The election season is too long. Yeah, a fiscally conservative, anti-imperialist, personal freedom loving, diplomacy first nuke last, government limiting, economic award winning, anti patriot act Republican who has a voting record to match his rhetoric is absolutely nuts. We Do This Every Four Years Jack So Weather Or Not Were Ready I Guess Its Coming Right? Im Excited To See Who Will Actually Jump In The GOP Race For President-Who Is Actually Brave Enough To Stand Up To President Obama? We All Know Sarah Palin, Mitt Romney, Mike Huckabee And Maybe Ron Paul And Newt Gingrich Will Probably Run But What Will Be Interesting More Than Anything To Me Will Be To See If "The Donald" (Donald Trump) Runs For President. Its Going To Be An Exciting Next Couple Of Years As We Get Ready For "The 2012 Presidential Race"
Campaigning for office should mean working hard, building consensus, and leading by example. In that regard politians are always running. With this bunch they have to start their mantra telling me over and over why they should be elected instead of showing me. Yes, I am ready to hear idle promises and empty rhetoric. I like to see the "not so educated' being taken for a ride by interested parties. I like to follow partisan commentary on TV. I like to have aspiring candidates begging for my vote. I like to hear about reducing “big government”, without specifics of where the cuts are envisaged. All in all, the aspiring politicians know that the country which had the best educated labor force not so long ago is now different and could be treated like puppets. Yes, I am looking forward to the next campaign. It means that most Americans don't care if their neighbor dies, goes bankrupt or buys enough guns to fill his garage. I thought the 2012 presidental campaign was already underway. After all, the media began talking about it right after the 2008 presidential election was over. no thanks, Jack – I would rather have a colonoscopy once a week than start this now ! The fact that Sarah Palin is even considered as a possible contender for the Republicans tells you all you need to know about the GOP. I watched Obama's presidential campaign with excitement and hope. I am Canadian and this was the first presidential campaign I ever watched. The first thing Obama did as President was bomb Pakistan. Now I know why I never watched presidential campaigns and never will again. The US is in terrible trouble and so are we Canadians. Politics is dead – terror rules. I pray that we the people will overcome and peace will prevail once again. "It means that most Americans don't care if their neighbor dies, goes bankrupt or buys enough guns to fill his garage." Or if their country murders innocent people in the name of physically fighting an ideology or sells weapons the same people and denies or selectively "forgets" their country ever did that. non existant.. "DEATH PANELS etc. Trex, have you seen the video of Bill Gates not only affirming, yes, they are real but they are also necessary to quell population sizes and to boost economies? Real people with real lives would rather not see or hear the endless political name calling ads, perpetually running every minute of every day for two years on our TVs and radios. Why can't the politicians change this to maybe 6 weeks at the very most? With that said, it will never happen...the media makes its living off this endless crap. Wait, there's going to be an election in 2012? I thought we cancelled it when we found out the world was supposed to end. If a President was limited to 1 term of 6 years, maybe that President would actually then focus the entire time on his/her job. The comedy begins. The GOP will ride behind Fox News and talk radio BS artistes, pundits will examine how you should vote based on approval ratings by race, income and whatever. The nastiest and craziest of us will bloviate on comment sections of newspapers and cable stations, and the most bizarre of all, Sarah Palin, will receive more coverage than any real candidate. And we think Texas and Arizona are crazy? We all are. Yeah I am ready!! I am ready for Ron Paul to run in 2012. Go Ron Paul!! Obama has been in office officially for two years YEAHH!!! !, But on a serious note, 2011 just started so let's not rush God's timing! Enjoy '11!! Hakuna Matata!!!!!!!!!! "Town Halls" need to be replaced with study halls. Then, maybe, just maybe, we can elect leaders, instead of idiots. The uninformed shouldn't be allowed anywhere near a voting booth. As long as corporate thugs keeping throwing money at obviously unqualified candidates, nothing will change, and we will continue to have perpetual campaigns. Unfortunately, that's not gonna happen. Case in point, two of the tea party winners attending a fund raiser instead of their own swearing in ceremony. Didn't we just get done with an election? We don't need more campaigning and useless political rhetoric. I wish I could get a job by spouting useless political nonsense and then only help those donating millions to my campaign. I can't wait! ... As a Canadian, this is blasphemis, but give me a good ol'd rootin' tootin' Amercian election campain over a hockey game any day! It's TV at it's best. ... Which of her dainty feet will Sarah Palin insert in her pretty mouth next? ... Who's going get caught talkin' trash into an open mike? ... Is the Donald going to toss his hat in the ring? Is Nader? ... Will Hillary swap jobs with Joe? ... Will Joe pull a "Joe"? ...Will Hillary pull an upset? ... It doesn't get better than this, even on skates! Why don't you just ask if we're ready for those Mayan end-of-the-world predictions in Dec of 2012. That'll probably be more fun than another election campaign. It would almost be worth the end of the world if it means we never again have to listen to hypocritical campaign rhetoric from either side! Yes! I can't wait to be bombarded with head splitting campaign garbage. But then ridding the America I love of the remnents of the progressive inhabitants of the House and Senate and White House will make the noise all worth while. Lubbock Tx. As we come to the beginning of another election cycle I remember the song: "Send In The Clowns" and I see they are coming back. Which clown will we pick? We need some time in our politics when it appears to be stable and we have the people working for us that we elected. The Presidency and the Congress seem to be in a state of constant flux. Forgive me if I am not ready for the next round of promises and lies. I'm just looking for someone to fulfill their promises from the last election. Spare me. Please. Both parties are the same, and run by the same elite. Might as well have the election now. The Republicans are committed to wasting the next two years anyway. I'm sitting this one out, Jack. I was over-active in the last one to get Obama here. I'm happy with him and I'm sticking with him. Let the Republicans slug it out amongst each other and I'll go about my life and just show up at the voting booth. We don't need another two years of campaigning. I got it let's pass a law. Oh, wait, too many of those already. I resign myself to the noise of inane political chatter. Politicians are always in perpetual campaign mode. They vote for bills based on if it will get them re-elected. They choose their words carefully so as not to tick off Limbaugh or Palin's potential voters. We've been subjected to never ending campaigns for years and the only way to stop the cycle is with term limits. I wish we could just have a Labor Day to Election Day "official"campaign period, with all the debates then, and all the advertising only allowed then. There should also he a finanical limit on how much advertising can be bought. Hello guys,get the job and keep your mind busy because you have to much time for stupid comments.You don't know anything about politics or economy because you live with food stamps.Just shut up. Is up to American people to decide theirs vote 2012.CNN you hate Palin because she is telling you what you don't want to hear. There's no way Obama will lose, all pretenders should save their money.Aspirants will spend too much money, obtained from too many rich people whom will ask for their tribute from winners. Those having gold make rules, those making rules get closer to gold. That's politics! Jack, my hope is that Florida Republican Senator Marco Rubio challenges Obama for president in 2012. You know...he's the Cuban-American with the 'funny name' and 'who doesn't look like all the other presidents' just like Obama said about himself. That way, when I see Janeane Garofalo being interviewed by Keith Olbermann on MSNBC criticizing Senator Rubio's policies, I can call her a "racist...straight up" for not wanting to see a Cuban-American in the White House. Well Jack technocally no but my personal mood is that from right now to 2012 if Stephen Colbert, Jon Stewart, Keith Olbermann, Chris Matthews, Rachel Maddow or anybody else who I watch to get my political fix runs for president I will indeed support and vote for them to be our new 45th president because I'm tired of the two party system and President Obama's bipartisan deals with the Republicans as the rest of us gets "Shalacked" in the process. "Surely you can't use paid for equipment by the tax-payer, to enhance your own position to the Everyday street Public?" NO! Our TEENAGERS don't need to see anymore bullying , thats all these politicians do, none of them ever really tell us what they stand for, it's all about knocking down the other guy. PLEASE POLITICIANS This time around be a positive influence on our kids! Politicians don't make it easy for parents to say bullying is wrong when it's all over our televisions with their commercials. For Gosh sakes Jack! They never stopped campaigning from last time! So presidents are only supposed to serve two years and then run a two election campaign? No wonder nothing get done in this country. Everyone knows Chris Christie could, and SHOULD, run and crush Obama in 2012. Has anyone heard this guy debate yet? It really isn't fair. And to think, he doesn't need the help of a little box telling him what to say, unlike some folks. *cough* Obama. I can't handle it! Aaaaaah! Make it stop. None of them including Obama impress me. No, an election just means that 'we' the people get put on the back burner! A bubble is NOTHING with a skin around it. Watch for the bubbles running for office. Jack, I heard countless Americans looking for relief from the mid-term; how on earth are we going to stomach the upcoming Presidential campaign with the same old cast of characters. A dentist from Chicago put up $5000 of his own money for the first campaign ad I've seen to vote for Hillary Clinton. And then you have the Donald – he's no trump card! If our politicians spent more time running the country than they did campaigning, perhaps more of the people's work would get done. Jack, I'm SO ready for the next go-round. This campaign ought to be very entertaining. As an ]Obama fan, I know whose campaign I'll be telebanking for again. I'll be ready for the 2012 campaign fever when it's the Iowa caucus and not a moment sooner. 2011 just began and I don't want to soak up all of this just yet. I want to see what Obama can do in 2011 and see what kind of legislation is passed. Sure maybe some will announce they are running; but lots of work needs to be done. I am ready for Obama to lay out his goals for next week's 2011 State of the Union Address. Ask me about 2012 when it's actually 2012. No one, but no one, is more responsible for the too-early start of election campaigns than the media. Wolf just admitted it. Cycle after cycle, he and others start talking about the next election even before the votes are tallied for the last one. Of course, no one makes more money off the campaigns than the TV networks, so......what would you expect? You mean there's a beginning and an end? Jack, I am definitely ready for 2012 and will do my best to help ensure the re-election of Barack Obama since I will vote for him and even work on his campaign. 2012 will be a very interesting year indeed. With the internet and telecommunications along with TV, We should be able to have the whole election in less than 2 months. Its not like the indviduals have to travel by horseback to each community. People whom are interested can simply go on line and see what a person is for and against. Also 65 to 70 percent are going to vote party line any way. We could have all the primaries the last week of September and the national election first week of November. Jack, i'm only ready if Congressman Ron Paul runs. Everything the Republican party is pretending to be now is what he was in 08 and his entire career. Run Ron Run! I don't know Jack. Are you and your fellow journalist ready to tell the truth on the issues to enable an informed public or are you just going to repeat the lies and statement of those running for office? I'm ready for the next campaign. It seems that politicians are perpetually campaigning for some office. Wouldn't it be great if they spent as much time doing the job they were elected to do as they do on campaigning? Imagine what they could accomplish for our country. No, I'm not ready. The people need a break. You mean there's actually a beginning and an end? I am most ready for 2012 election campaigns to begin. It should be very interesting & very refreshing. Democrats can not run on their record. They all caved in on the Bush doctrine, except for health care reform & that's not real popular. Republicans will talk health care reform transparency and jobs. I am ready for 2012..I was foolish enough to vote for Obama once, not again.. I am ready, provided there is a Political station. No public stations should carry the political jabber. No. I’m not sure our country, or me personally, will ever recover from the toxic hate filled 2008 campaign. And guaranteed it will be more toxic and hate filled than we may be prepared to handle. Yes! Because that means there is real Hope that another change will happen in Washington. Obama has not lived up to Hype. Time to listen to the voters again who asked for change in 2010. Unfortunately I have not found any worthy candidate to vote for in 2012. But with every election there is fresh hope for progress. Ron Paul for 2012......... We need this man to win we need a change. The USA as a hole is not going in the right direction if Ron won't run then we need you to run JACK. Yeah, bring it on *coughs*. Obama will win anyway, so why waste our time and money on all of the political shuck and jiving? Take the campaign money and apply it towards health care, homelessness, or the deficit. It never stopped for Sarah Palin so I'm just ready for it to end. The only high spot to her last run was the "Cafferty Rant of No Excuses". I loved it. That's one of the two reasons I pray she runs again. If she runs, Obama can walk and win. During summer vacations while attending school I worked at a Michigan chicken farm for extra money. In about August every year we would open the back doors to the football field length Quonset huts that held thousands of chickens and take high pressure fire hoses and begin the arduous task of washing the mountain of chicken $#*! out the back. That manure flowed like the Detroit river. Every election cycle I think of that task. Jack : Isn't it time the U.S rethought the logic of holding a midterm election. It just seems to me a bad idea because it doesn't give elected politicians enough time to work on lawmaking before they have to get back to campaigning and that is such a distraction. Not to mention the enormous expense. Most countries in the world elect their politicians for a term of four or five years. It just makes no sense to me to be constantly sucking up to the electorate who change their mood every few months or so. Bob Mckinnon, N.S. David in Vancouver, thanks for the laugh. How refreshing to see the entertainment value of our politics from someone on the outside looking in. Puts all this nonsense in perspective. Jack, I am ready to get to work tl help re-elect President Obama. The Republican party seems bipolar. The talked people who might run are a list of folks who are not smart enough or too narrowly focused or not focused at all on the needs of our people. The work is not just to re-elect our president but to send some smart people to Congress who will work together and move us forward. The time is now to get started because far too many voters have no idea what we have gotten done and what we stand to lose if the republicans hold too much power. So presidents are only supposed to serve two years and then run a two year election campaign? Wonderful to know all are interested in running for office again. but how about concentrating on business at hand first. No, I'm sick of politicians writing books, pandering for money and lying at the same time. I used to believe elections was ONE place citizens had an influence on politics. But not after Citizens United. It's clear the Supreme Court decision was political, made so that corporations can choose the politicians FROM NOW ON. It is usually all about money; the next election will run in the billions, and citizens voices will be drowned out by the megaphone big business has been given. Well, I'm not ready now nor was I ready when it did start on November 5th. We have been getting the lip service since then and soon the ads start. The networks are counting the millions already. I am a moderate who has been living in NH for 30 years, where the mid-terms normally lead into the presidential primaries with state and local elections mixed in. There used to be a time when there was some peace and sanity, dare I say even some harmony, but not anymore. The polls and phone calls are tiring and aggravating as is, but after the vitriol of the mid-terms of 2010, I'm not ready. I'm tuning out and hanging up, something I've never done before. I'm ready for 2020 - without needing to wear glasses. Are you kidding? I am sick to death of politics! For two years we've watched Republicans jocking for position and not supporting President Obama in any way, just so they'd have a chance to win the republican nomination. If the midterm elections were any indication of what the next two years will be like, we'll need to brace ourselves for a nasty two years, and use our mute button on our TV remotes every time we see their faces because you can't believe a word they say!!! Yes, say that again, i am impatiently ready to vote president obama in again. I wish the voting take place now. He inherited problem bigger than the entire world, but in a twinkle of an eye, he solved half of the problem in less than two years. Even though republicans and his supporters don't see this remarkable achievements, it is clear that president obama is like Jesus who came to save mankind from perishing but some people did not appreciated his sacrificial efforts and send him to pilate for judgement. Even when pilate could not find any fault, people were still shouting crucify him, crucify him, crucify him. For now, i think president obama is still the messiah we were yearning for. No I'm not ready. What I'm not ready is to see billions of dollars spent to elect somebody that will just vote what there party tells them to. Does the party leader tell these guys what to eat too. Jack, are you kidding? The 2012 campaign began before the President was sworn in. The Republicans announced their intention to limit him to one term immediately after his inauguration. Your pundit panel declared him a one-term president over a year ago. The midterm elections were a phase of the 2012 campaign and most commentators said as much. David Gergen said it: every is political and the campaigning never stops. NOW you're asking? Oh god just shoot me now. The phone , do not call list does not stop the political phone calls and bot calls. My hypertension is just getting back to normal. Please no, no more lies , miss infomation and I wasn't refering to Sarah she is a Mrs. among other things. What do you mean start the campaigning. It has been going on ever since our President was elected. I will vote for President Obama.for sure. Huckaby is probably the best they have, but he has an R in front of his name. He needs to get far away from the tea groups to be a good canidate. I will vote Democrat, as they are the ones that help all middle class and poor people. NO...capital N, capital O. In this household, we are sick of politics on the news. We want a news channel that tells us what is happening in North Dakota, Oklahoma, Hawaii, Australia, Chile...get the idea? We want news, not opinions and popularity polls. If the parties ramp up too early, we middle-of-the-road Americans will tune them out and be resentful of these ardent politicos hogging the airwaves. The country is in constant campaign mode. That's why very little actually gets done. The money wasted in this process is off the charts.